4. Commercial market intelligence by way of design, trend and technical colour forecast. Certain changes like hike in the wage compensation, duration of the programme etc. have been made in this scheme so as to suit the present day requirements. 5. Financial Assistance for supply of tools, safety equipments, looms, furnace etc. 6. Shilp Guru Award, National Award & National Merit Certificate(NMC) for outstanding contribution in Handicrafts Sector. Training imparted to artisans for upgrading their technical skills and betterment of product design. Wage compensation to Artisans to the tune of Rs. 300 per day for 25 days in one months. Salary to master craft persons to the tune of Rs 30,000 per month. Distribution of tool kits to artisans. Recognition to master craftspersons through Shilp Guru Award, National Award and NMC. Artisan will able to trained and get benefited by new and innovative designs as per the taste of market for production of items. Provision of digital designs to the artisans for mass productions. Question : How to get information of ongoing DDW/IDP. Ans. Information could be provided by concerned field offices or regional offices of ongoing DDW/IDP in district or block under their jurisdictions. Question : How to get information of new designs as per latest trends for production. Ans. Information could be provided by our concerned field offices, design centres or design banks/NCDPD/EPCH/MHSC/IICT etc. Ans. There are five Regional Design and Technical Development Centres located at New Delhi, Mumbai, Bangalore, Kolkata and Guwahati respectively. 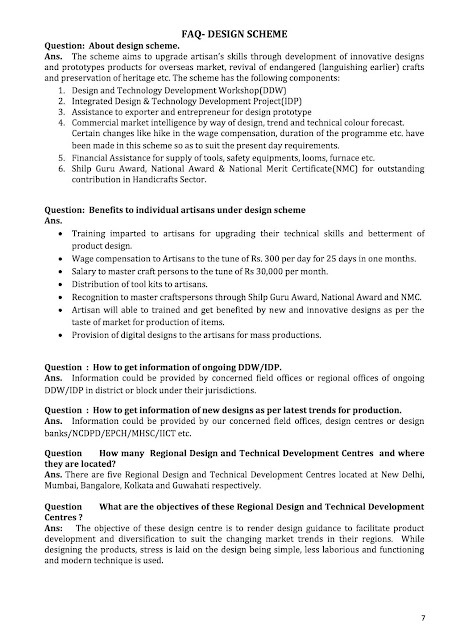 Ans: The objective of these design centre is to render design guidance to facilitate product development and diversification to suit the changing market trends in their regions. While designing the products, stress is laid on the design being simple, less laborious and functioning and modern technique is used. Question What are the activities being under taken by them? 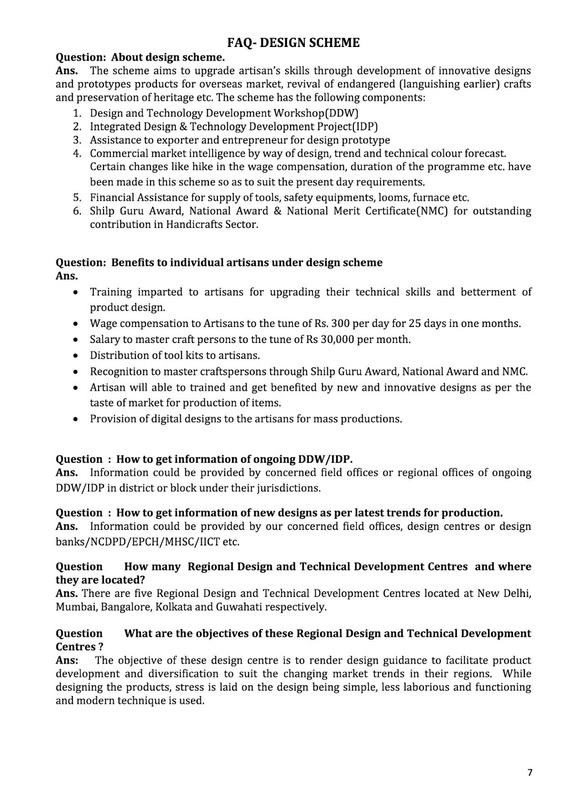 Ans: These centre conduct Design workshops, Integrated design projects, Craft awareness progammes, Development of improved tools kits in different crafts under their jurisdiction and conduct research work. Question : Is any recognition given to outstanding crafts persons in the handicrafts sector? Ans: Yes, Shilp Guru Award, National Award & National Merit Certificate(NMC) is awarded to a craftsperson only once in a lifetime to encourage master craftsperson’s to maintain excellence in craftsmanship and keeping alive our old tradition. Question What kind of assistance and funding pattern is provided to awardees? Gold Medal, Rs. 2 lakhs and Tamra Patra for Shilp Guru. Rs. 75,000 for National Merit certificates holder.